Catholic Lourdes Wall Plaques and Last Supper Wall Plaques. Lourdes Wall Plaques dedicated to our Lady of Lourdes and Saint Bernadette. 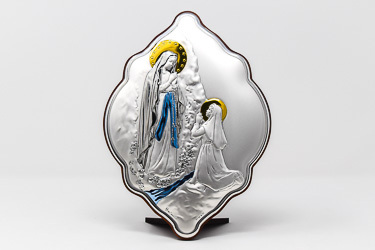 STUNNING Lourdes Apparition Silver Plated Icon Wall Plaque. STUNNING Divine Mercy Silver Plated Icon Wall Plaque. Silver Plated Last Supper Free Standing Ornament. Last Supper Plaque - Silver Plated. Italian Silver Plated Holy Family Wall Plaque. Bernadette Gold Foil Mosaic Wall Plaque. Teaching Christ Special Gold Foil Technique from Italy. Miraculous Wood Plaque Icon with Gold Foil. Last Supper Wood Plaque Icon with Gold Foil. Lourdes Wood Plaque Icon with Gold Foil. Teaching Christ Icon Gold Foil Wood Plaque. God the Father Icon Cross Wall Plaque. Our Lady of Lourdes Wall Plaque. St Michael Guardian Angel Mosaic Wall Plaque. Last Supper Cross Icon Gold Foil Technique from Italy. Lourdes Apparition Gold Foil Mosaic Wall Plaque. Mother Teresa Gold Foil Mosaic Wall Plaque. Our Lady of Perpetual Help - Gold Foil Wall Plaque. Last Supper Icon Wall Plaque. Mysteries of Light Wall Cross. Our Lady of Lourdes Laser Cut Wood Plaque. St. Bernadette and Our Lady Wall Plaque. Laser Cut Wood Cross Divine Mercy. 3 Pope Wooden Lourdes Wall Plaque.